LIFEPAC 3rd Grade Bible teaches the important basics of Christian living. Exploring stories of biblical characters such as Abraham, Joseph, and Paul, themes cover: You Can Use the Bible, The Life of Jesus Christ, Living for God, God Takes Care of His People, and God Gave the Need for Friends. Integrated with mastery-learning techniques and Scripture memorization, worktexts make grasping biblical concepts easy. Filled with color illustrations, tests, and review exercises, this course's worktexts also include fun writing activities that develop grammar skills. 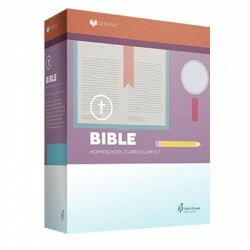 The LIFEPAC 3rd Grade Bible Set contains ten worktexts and a teacher's guide.